See the website for more photos and for a video. Volvo is bring its robo-car army to its home country of Sweden, with 100 autonomous vehicles taking to the roads of Gothenburg in the next three years. Google is still leading the way in the autonomous vehicle space, with dozens of self-driving cars having racked up over 300,000 miles in the past two years. Automakers are scrambling to catch up, with Nissan’s commitment to bring the first electric, self-driving car to market in 2020, while Ford, General Motors, Audi, Mercedes-Benz, and BMW are working on their own semi- and fully-autonomous systems. But Volvo’s plan is the most aggressive yet — at least from a company that isn’t also putting computers on our faces. 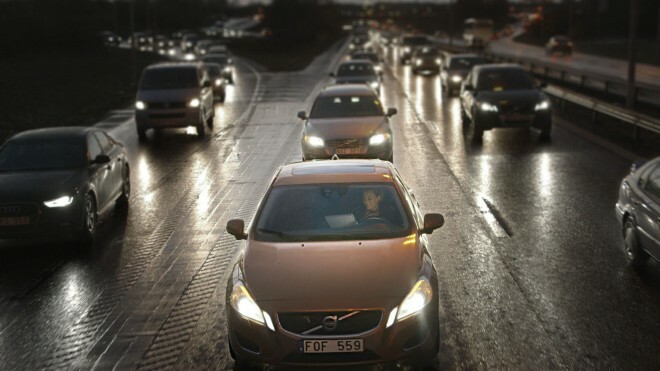 The program is called “Drive Me”, and in collaboration with the Swedish Transport Administration, the Swedish Transport Agency, and the Lindholmen Science Park, Volvo will put 100 autonomous cars onto the roads of Gothenburg in 2017. Those real customers will be selected next year during a research program, with 100 drivers hand-picked to participate in the autonomous vehicle trials. The initial round of testing will take place on over 30 miles of public roads, with a mix of commuter arteries, congested city centers, and freeways. Volvo is out to see exactly how autonomous vehicles will boost traffic and fuel efficiency, determine what additional infrastructure will be required for a larger self-driving car rollout, and how both the 100 driver/riders and surrounding motorists interact with the vehicles. Drive Me is just the latest self-driving program Volvo has worked on over the past few years, including successful testing of its SARTRE road trains that use a big rig with a driver and a brace of on-board gear to control a platoon of networked vehicles behind it. In the meantime, Volvo is promising to offer a semi-autonomous driving mode on the 2014 XC90, which — like the system already available on the new Mercedes-Benz S-Class — would combine adaptive cruise control with a system that keeps the vehicle centered in the lane at low speeds.